Gravity Institute is incorporated to impart quality education to students preparing for various competitive examinations with the sky-high ideas and commitment to excellence. Our coaching center branches are located suitably in the different areas of Delhi including Saket [Head Office], Sarojini Nagar, Dwarka Mod and Mahipalpur. Gravity Institute - A name that has been flourished over the years, is considered as one the most competitive, high standard coaching institute in Delhi. It offers coaching for entrance exams of various competitive examinations like for NDA, CDS, CLAT, CTET, SSC, Bank, Police, AFCAT and other government Services. Gravity Institute is committed to guide you in achieving your treasured dream by sharpening your skills and shaping your career. Gravity Institute's focus is to enhance development of the students through quality teaching to help them become successful. 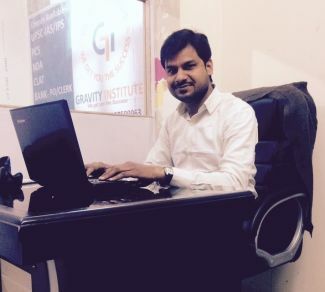 Join Gravity Institute, it's a most trusted and highly result producing coaching institute, having well renowned faculties from IITs, IISc & reputed organizations. Gravity Institute provides coaching for NDA, CDS, CLAT, CTET, SSC, Bank, Police, AFCAT coaching as per the recent examination pattern. At Gravity Institute we aim at the upliftment of urban and rural youth, driven by a relentless quest to excel. Gravity Institute consistently & passionately is on the move to acquire synergetic outcome among a blend of knowledge, skill, creativity and aggressive competence on the bedrock of ethics and values for its budding professionals. We procure the support of a strong team of faculty members, who wholeheartedly put their efforts to motivate our students and guide them to progress at every step. In a conducive learning environment at our serene institute, we nurture champions, who, with intellectual brilliance and ethical excellence, emerge out as leaders with a difference! Thank you for considering us as the best coaching Institute for your child. I would like to thank Gravity Institute for helping me crack SSC 2015. The guidance by all the teachers., the support of office staff and the study material, everything is just perfect to take you through SSC and other exams. Thank you Gravity Institute for making my career. I am happy to be a student of Gravity Institute for bank and SSC preparation. I have cracked SSC exam. They covers all the aspects of the examination. The faculty at the centre is highly motivating. Gravity Institute provides a detail analysis of every attempt of a student. A serious aspirant should join this Institute if he wants to crack SSC & Bank exams. What we have for you! Classroom sessions that focus on getting you geared up and easy with all your concepts to face your examinations. Our dedicated doubt clearance cell helps student to clarify their queries from our renowned faculty team. Best In Class Online Assessment Portal to ensure your preparation is effective and efficient.